We sensed that what happens in both individuals and larger systems reflects patterns of transformation present in the natural world as a whole. These patterns, we felt, were expressions of an evolutionary direction running through all levels of creation. This evolutionary impetus we called the ‘Way of Unfolding’. The term ‘Way of Unfolding’ is simply a way of referring to ‘how things are’ or perhaps more precisely ‘how things become’. The Way of Unfolding touches our lives in a number of important ways. First, our life itself is in a process of unfolding, leading from birth to death, day by day and moment to moment. Second, our individual lives are themselves part of a wider process of unfolding in our families, communities, and the natural world. Third, we are very much aware of, and respond to, this process of unfolding. Our sensitivity to pattern makes us aware of recurring tendencies in the unfolding of our world. And in those recurring tendencies, we intuit a deeper coherence and unity running through all the diversity of life. Our sense of personal alignment provides continuing feedback as to whether we are in a coherent relationship with life’s unfolding pattern. Sensitivity to pattern, and growing alignment with the deeper pattern of our lives, allows our personal unfolding to resonate with the process of Unfolding in life as a whole. When this happens, we enjoy and support fullness in life, both in ourselves and in others. We flow with the stream of life, and are able to accomplish much with minimum striving. Life supports us as we support life. This is in a nutshell is what we mean by ‘the Way of Unfolding’. Pattern appears at every level of creation, from the sub-atomic to the galactic, from simple cells to whole societies. Our own minds are also peculiarly organized to perceive and handle pattern. Pattern, as such, we can define as partly present in the world and partly the expression of our own ‘punctuation’, to use Gregory Bateson’s term. Our punctuation in turn is a result of our existing patterning. We are, in effect, both the creators and the creation of our patterning. If we examine both the patterning of nature and the nature of our patterning, we find that pattern has the valuable function of simplifying yet enabling complexity. Simple patterns in nature appear to underlie surface complexity. And the patterning of our minds enables us to understand and manage the complexity of our world. Ultimately, we sense that the patterning of nature and the patterning of our minds emerge from simple meta-patterns that are present in both mind and nature. For Bateson and other perceptive thinkers, mind and nature are a ‘necessary unity’, complementary facets of ‘a pattern which connects’. If we speculate as to the nature of such a pattern, we can concur with Wallace Stevens that ‘it must be abstract’, but capable of imbuing the range of creation through to its most concrete expressions. Examining the pattern to simple patterns we can get some ideas as to how to think about a connecting meta-pattern. Simple patterns can be described, as the British poet G. M. Hopkins did in the last century, as a configuration of ‘sameness’ and ‘difference’. Pattern implies some repetition (sameness) that is somehow distinctive in relation to its context. The sameness stands out as a difference in the world. However, the notions of ‘stability’ and ‘change’ are probably more apposite than sameness and difference when we consider dynamic processes. It is possible to describe nature”s patterns as emerging from a dynamic tension between tendencies toward differentiation or change and tendencies towards homogeneity or stability. But the relationship between stability and change factors alone would not of itself account for the enormous wealth of self-evolving patterns present in nature. So much of the patterning we observe in the natural world carries the possibility of developing in surprising and creative ways that we propose a third characteristic immanent in nature’s patterning. This we call ‘self-transcendence’. The patterns of nature have the capacity to transcend themselves, either by learning or by becoming part of larger ‘holons’ (to borrow Wilber’s term) that include them but manifest another order of possibilities – as molecules transcend, while including, the atoms they are made of. Where nature’s patterning (and our own) displays a tendency for new possibilities to emerge out of the tension between factors fostering stability and factors provoking change, we may talk about ‘Generative Patterns’. Generative Patterns are patterns with a capacity for self-transcendence. They can change, learn, and grow. Living systems are Generative Patterns, as are social systems. The development and evolution of Generative Patterns is, in effect, the story of the Way of Unfolding. Unfolding happens in and through the Generative Patterns of the natural world. Our own patterning becomes generative when we find we are learning about our learning in a way that fuels further learning and growth. 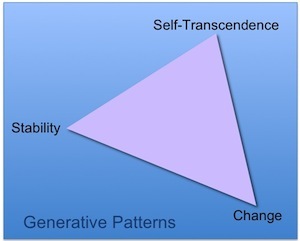 We can thus think of ‘Generative Patterning’ as the exploration and description of how we manage the relationship between stability and change, sameness and difference in a way that is self-transcending for ourselves and for the continuum of self-and-world. Generative Patterning is the process of having a self-transcending relationship with the patterns of our lives. For human beings, this self-transcending relationship with the patterns of our lives has much to do with how we interact with our ‘models of the world’. To perceive patterns in what we encounter is a first step to managing life’s complexity. To give meaning to those patterns and code how they relate to each other for future reference involves another deeper level of processing, which we can call ”deep learning”. In deep learning, the complexity of what is not yet understood or integrated crystallizes into a coherent form that becomes part of us. For instance, mastering the actions and skills that are part of learning to drive lead eventually to the realization that ”I can drive”, and beyond to ”I am a driver”. In deep learning, we not only generalize about ourselves from the knowledge and skills we acquire, we draw conclusions about who and what we are from all kinds of interactions with family, friends, and society, as we grow and develop. This process of generalization from our experience enables us to us to manage the rich complexity of what we have been encountering and apply it in our lives. This process in which we generate a crystalization or mental coding synthesizing the patterns we have been encountering, we call ‘modelling’. Modelling with patterning are at the heart of the learning process. When that process is shaping our sense of who we are and what we can and cannot do in the world, we can talk of ”deep learning”. Whereas pattern occupies an intermediate zone between ‘things as they are’ and our coding of them, models are primarily products of our mind. We create mental models when we attempt to understand and manage the pattern to the patterns we perceive. Compared with patterns, models are one step removed in the direction of pure mental constructs. Patterning is essential for modelling, while the latter is an integral part of deep learning. Unfortunately, our mental models can be both a blessing and a curse. While they enable us to manage complexity, they also shape our responses to the world, reducing our ability to respond creatively and freely to the here and now in all its freshness and immediacy. Our mental models determine our unconscious epistemology – our unconscious assumptions about the world and how we give meaning to experience. Our mental models can both support alignment with the greater pattern of life and they can obstruct it. To flow with life’s unfolding pattern implies becoming more conscious of our unconscious epistemology. If we can recognize the unconscious assumptions implicit in our models of the world, our mental modelling can miraculously undo and update some of its own functioning. The Way of Unfolding as it manifests in us humans thus invites us to give a lot of attention to how we know what we know. This attention to how our mental models are shaping our world forms an important part of an Applied Epistemology, of which Generative Patterning is a central element. Generative Patterning helps us recognize the creative tensions that define our reality. It helps us pinpoint the pull between complementary, but potentially antagonistic, tendencies that are an inevitable part of how we make sense of our world – such as between ”inner” and ”outer”, between ”self” and ”other”, or between ”separateness” and ”connectedness”, for example. Dichotomies such as these are so basic to how we make sense of the world that we forget that they are essentially mental constructs. It seems so self-evident that there is a ”here” and a ”there”, a ”self” and an ”other”, an ”inside” (my memories and dreams) and an ”outside” (the physical world and the others in it) that we forget that such distinctions are arising from our experience and how we label it. We forget that we are each drawing the lines in our mental maps in different ways. By helping us recognize how we are carving up and constructing the world in ways that seem true, but are actually arbitrary, Generative Patterning helps us have a more conscious, flexible, and creative relationship with our own deep patterning. 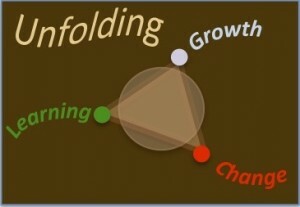 Unravelling and renewing the sometimes confused and confusing strands running through our underlying models of the world enables growth and development to unfold, whether in ourselves or in others. Inevitably, questions about our own knowing lead us to explore and fathom the nature of that which is knowing. Exploring our deep epistemology, brings us to an edge. Who or what is the knower of our experience? What can we know of the knower? Is there a distinct knower? And what is its nature? What are we assuming to be self? And how valid are our assumptions? Is there a pattern of development in what we take to be self? Is personal identity anything other than an artefact of our patterning and modelling? What is the eventual destination of that which we take to be ‘myself’? And, of course, in working with people, in coaching or therapy these questions become central, as we grapple with what the client or coachee is assuming about self or the world that is constraining him or her and which may not be completely true. A number of approaches to personal development, such as NLP, emphasize the importance of change in our lives. But change without reference to deeper learning and growth is likely to be either shallow or problematic. Change is never without a dance with stability. Often change begins ”outside” of ourselves. Change may manifest first as a shift in behaviour or a change of context. The world may throw the challenge of change at us, or we can initiate behavioural and contextual changes. We can change our partners, jobs, homes, life-styles, and so on. Changes in our context or circumstances constrain the patterns of our lives to new configurations. The economy goes sour, our company closes down, or we fall in love, and the knock-on effects in our lives are profound. These effects we term ‘learning’ (rather than change), when they involve the acquisition of new capabilities or the realization of fresh ways of framing our experience. Learning enables us to manage increasingly complex patterns of similarity and difference in what we perceive. With its drive for simplicity and coherence, learning helps us accommodate complexity, boosting the connections and relationships available to our minds. Paradoxically, learning is a fundamentally conservative process. In providing us with the means to manage the pressures of change, learning has the valuable function of supporting stability in our lives. Much of our learning serves to expand our ability to cope with new developments so that our personal selves remain secure. Eventually, of course, our learning rubs up against the limits of our self-paradigm, and we find ourselves entering a period of profound revision of our sense of who and what we are. We may emerge from such periods of personal development different than before, but it is then more accurate to speak of ‘growth’ rather than either learning or change. Because growth involves a significant outframing of our usual frames of reference, much of it happens at an unconscious level. We cannot really renew our old selves from within the old mould. The mould itself must expand. That implies a surrendering to larger processes than those that make for our usual selves. We cannot ‘do’ growth, but we can support it. Generally, people do not change. Rather than trying to alter ourselves or others, we might be wiser to seek small behavioural changes that will indirectly engender new levels of learning and growth. This approach was widely practised by Milton Erickson, who gave many of his clients simple behavioural tasks that would inevitably lead to developments on other levels. The hierarchical relationship between change, learning, and growth in our lives points to a larger pattern that only becomes apparent over time. It is as if the story of our lives gradually discloses a coherence and meaning as a whole that we recognize retrospectively. This trajectory of growth manifesting over a lifetime, we call ‘unfolding’. The notion of ‘unfolding’ implies that what we become is already implicit in what we are in the beginning, just as a tree is implicit in a seed. We cannot predict what specifically will happen in a person’s life. For the pattern of unfolding is shaped by the circumstances and events that happen around us. But when we consider our lives as a whole, we can appreciate a pattern that has been revealing itself all along. This larger pattern often makes some of the surprising choices that people make at particular moments in their lives understandable. We could say that our own personal pattern of unfolding is actually part of a larger pattern that is also unfolding. Our societies and cultures also change, learn, and grow over time. They are part of an evolutionary process that has brought our world to where it is now. And the unfolding of life on our planet is part of a still larger process of unfolding that includes everything that occurs in the cosmos as a whole. The ‘Way of Unfolding’ is thus a way of referring to the self-evolving processes of nature. It is also a way of referring to those same processes happening through the unfolding of the creative tension in the Generative Patterns that makes us who we are, and in the unfolding of the great Generative Pattern that is the cosmos itself. Personal unfolding appears hard-wired within us. Given the chance, we are as if pre-programmed to grow and evolve towards the expression of higher values. Our deepest values appear to both drive and orient our unfolding, even when these values are apparently ill-expressed through some unfortunate behavioural choices. Life calls us to the best that we can be at any particular moment in time. This tendency is well-recognized in the NLP paradigm with its presupposition that ‘every behaviour serves a positive intention’. Of course, positive intention does not necessarily mean positive behaviour. Much learning and growth may be needed for our inbuilt yearning for the highest and the best to be able to express itself appropriately through action. But without that inherently life-affirming tendency within us, deep learning and growth would not be possible. The Way of Unfolding thus invites us to become as sensitive as possible to the pattern unfolding in our lives. When we are able to align ourselves with this unfolding, we come naturally into harmony with ourselves. Of course, we may need to undo some of the particular conditioning that warps our personal predispositions, setting, say, head against heart, or belly against brain. That may also be part of our unfolding. However, as we come into alignment with the pattern unfolding within us, we also come into harmony with the larger pattern of which we are part. We flow naturally with the current of life itself. There is no dissonance between our own evolution and that of the world around us. Such alignment involves a profound readjustment to how we often think of ourselves and our place in the world. Such a realignment is on another level than the common focus on setting and achieving goals, which have a place, but on the appropriate level. The call of growth, and the larger unfolding that drives it, involve a way of approaching ourselves and each other that is non-linear. Defining goals and then specifying the steps for reaching those goals is appropriate for behavioural changes or for specifying learning outcomes. But is an inadequate frame for supporting the mysterious subterranean processes of growth. For that, more circular and systemic models are appropriate. In our work with individuals and groups, we find we are often accompanying a process that is unfolding in its own way, without any clear ‘goal’, except the knowledge that we will recognize what we have been approaching when it emerges. Such exploration of deep patterns of belief and behaviour we call ‘Re•Patterning’. Re•Patterning invites a collaborative process in which large measures of ‘not knowing’ allow us to spiral closer and closer to the heart of the mystery that we are. Such work is better represented by radiant rather than linear models. The rose or lotus has been a universal symbol for unfolding in the major spiritual and cultural traditions of the world and it is important to us, too. In Bali, a sense of the deep unity of the pattern of unfolding running through different levels of creation pervades the culture. The Balinese invest a lot of time and energy in activities intended to harmonize the ‘buana alit’ (the small world of our personal selves) with the ‘buana agung’ (the big world of our social and natural environments). Ceremonies (yadnya) are widely used to promote such balance, both at the individual and collective levels. Ceremonies do not of themselves prevent the kind of ecological challenges to the environment that inevitably accompany modern technology. However, they do help preserve a fabric of unity and balance in society, in spite of enormous pressures for change from international tourism, migration to an already crowded island, and the general push towards globalization. In times of national instability, Bali has typically remained relatively calm. When calamity befalls them or their own culture is ignored by the dominant majority, the Balinese have tended to respond with a special ceremony or yadnya. When traditional values are appropriately invoked in Bali, they lead to rapid shifts in how people act. For example, when the government wanted to promote family planning with its ‘two children, enough’ campaign, compliance was fairly swift, in spite of a strong tradition of large families. In Bali, the importance of the alignment of the personal, social, and natural worlds is reflected in the ubiquitous symbol of the eight-petal lotus. The lotus or eight-petal ‘rose of the winds’ provides a compact model of both the small and large worlds and the processes of transformation animating them both. For the Balinese, the geographical orientation in space, the macrocosm, is reflected in the microcosm of the human body mind. The eight main directions of the compass originating from a central point suggest complementary energies, driving the processes of change both in nature and in our lives. These are reflected in the organization of our bodies, in the layout of homes, temples, and villages, even in the sacred geography of the island as a whole. During our research into the Way of Unfolding, Jan Ardui and I found that the Balinese eight-petal lotus offers a simple but potentially rich and complex way of understanding the connecting pattern running through both the micro and macro dimensions of our experience. This lotus or compass or mandala, when translated into today”s language, suggests a highly valuable way of understanding and orienting our relationship with the process of unfolding in our lives. The north-south axis of the lotus represents the deep structure of Generative Patterns. The ‘north’ represents the quality of stability, and the ‘south’, change. The centre represents the quality of ‘self-transcendence’, connecting the polarities and allowing higher levels of organization to emerge. In Bali, the centre is sometimes treated as the unifying source of diversity, and sometimes as that which contains and reconciles opposites – male and female, sky and earth, positive and negative, and so on. The centre is thus the source and expression of complementary qualities, which we may term ‘energy’ and ‘intelligence’, or, more poetically, ‘strength’ and ‘purity’. These are traditionally represented in the ‘west’ and ‘east’ of the lotus respectively. The cardinal directions represent the deep structure of the dynamics of transformation both in our lives and in nature. The dance between the opposites of stability and change has direction, meaning, and power because of its intrinsic energy and intelligence. We are able to change, learn, and grow, because the forces of change and the forces of stability exist in a state of creative tension that invites the new without overwhelming it. Order and chaos coexist, allowing the precious and precarious miracle of life to emerge and evolve. Out of the self-interacting dynamics of this simple set of relations, a more manifest layer of patterning emerging. The interaction of the four cardinal directions suggests four important tendencies, which are mapped symbolically in the north-west, north-east, south-east, and south-west. For example, the relationship between ‘energy’ and ‘stability’ in the north-west points to a purposefulness that we call ‘direction’. Without some kind of direction, nothing much happens either in nature or in our lives. But direction is blind if it ignores the wider context. So, opposite ‘direction’, in the south-east, between intelligence and change, we situate ‘connection’. For change presupposes time, and time implies both a ‘when’ and a ‘where’. In relation to intelligence, change thus implies in our lives the whole ecology of action – the right things happening at the right time. Recognizing and contextualizing direction, are of course only possible when we draw on sources of inspiration within. In alignment with the Balinese model, between ‘stability’ and ‘intelligence’, we locate ‘inwardness’ or ‘inspiration’. This quadrant suggests the process of connecting with the grounding awareness which provides a backdrop and creative source to more active processes of the mind. For transformation to become possible, such inwardness needs a counterbalancing expressiveness or passion, which we find opposite it in the eight-petal lotus, between ‘energy’ and ‘change’, in the south-west quadrant. Here we find the dynamism that makes the wheel of life turn. These opposite qualities (inwardness and expression) work together and in conjunction with the other pair of qualities (direction and connection). Passionate expression makes for dynamic action in the world, but action is blind, without a counterbalancing inwardness, supporting ecology and wisdom in the choice of direction. So together, direction, inwardness, connection, and expression point to a dynamics of transformation. They suggest a systemic relation with each other in a way that can support the different levels of change, learning, and growth in our lives. At a further level of specificity, these basic qualities operate in our lives through five important ‘Keys to Mastery’. 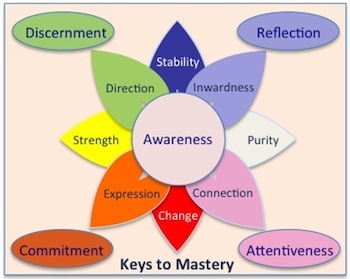 The Keys to Mastery help us function well in any situation. They help us manage the processes of change, learning, and growth in our own lives, and in our areas of responsibility as leaders, managers, coaches, or citizens. The art of reflection, for instance, helps us connect with and draw on our inwardness. To read the runes of time, at any moment in the unfolding pattern requires the ability to reflect deeply, allowing life’s enigmas to yield new knowing from deep unknowing. Such inner responsiveness requires a profound attentiveness to the patterns present in and around us. It also needs a discerning willingness to cut through the crap to the core issues. And lastly it needs the ability to commit wholeheartedly to action. And all this supported and sustained by inner Awareness. Within the ground of Awareness, Reflection and Attentiveness allow us to embrace the complexity of the present moment in a creative way. Discernment allows us to choose a direction, while Commitment ensures passionate execution. In consort, the Keys to Mastery – Discernment, Reflection, Attentiveness, Commitment, within simple Awareness – ensure skill in action and a high level of personal and professional effectiveness. Together with patterning and modelling, they provide the basic tools for an Applied Epistemology that helps us fine-tune our relationship with how we live our lives day by day. Together they enable us to manage the complexity of life’s patterning, revealing a naturally harmony and alignment with the pattern which connects. When they are applied to the knower, the Keys to Mastery facilitate a process of self-discovery that leads to the heart of the mystery that we are, to the freedom beyond our self-definitions, in the simplicity of being that we call ‘Living Awareness’. Such self-knowledge, such ‘knowing in unknowing’, appears as both the destination and way of all our unfolding. It is the source of both pattern and alignment, their origin, their guiding principle, and their eventual destination as we reawaken to that which we never ceased to be one with. It is the centre from which the processes of transformation emerge, the source of self-transcendence as the kaleidoscope of life unfolds, and the place in which the dynamics of transformation find their fulfilment, as we reawaken to what we have sought throughout our unfolding, but have actually never left – the deep ground of Living Awareness. Of course, all this is only a model, a mental map, an adjunct to things as they are. It points to a Way of Unfolding without being the Way of Unfolding itself. That is always happening by itself, in its own way, here and now. We can allude to it, try to talk about it, but it for ever eludes our names, definitions, and programmes to capture it. The key is to live it. And that is really what is unfolding anyway. Whether we like it or not. Peter Wrycza, PhD, Nirarta Centre for Living Awareness, 2001, revised April 2013. 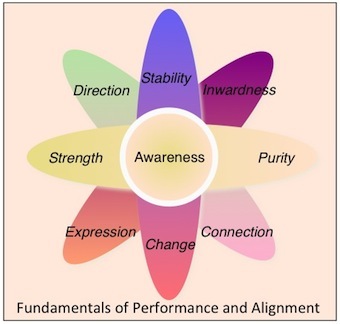 A version of this article, which offers a synthesis of some of the key material in our book, When Performance Meets Alignment: A Compass for Coaching and Mentoring, Authors OnLine (2005), first appeared in the international journal NLP World, published by Peter Winnington, in March 2001.